Life expectancy for a house rabbit is between 8-14 years. 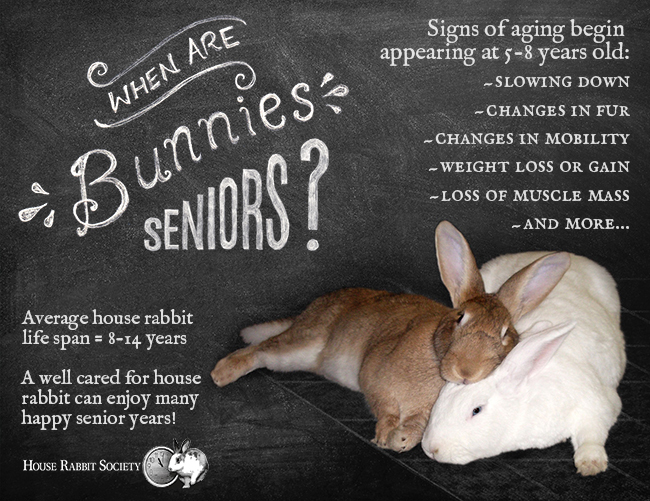 But when do rabbits become seniors? There is not an exact age when it happens. However, sometime between the ages of 5-8 a rabbit becomes a senior. When the signs of aging start to manifest is partly based on the size of the rabbit, genetics, the quality of care he’s received throughout his life, and even if he has a loving bond mate. Aging is a natural process. A well cared-for house rabbit can age gracefully and enjoy many golden years. Your rabbit may need some level of nursing care at some point in her life. Expect this and know for a fact that she will be forever grateful for your loyalty and love. Caring for our elderly companion animals is part of the commitment we make to them that honors the years of love and friendship we have shared.